It was a few years ago when I had just stopped training full-time for my sport. Still training twice a day, I had a massive appetite. we visited the Red Hot World Buffet. 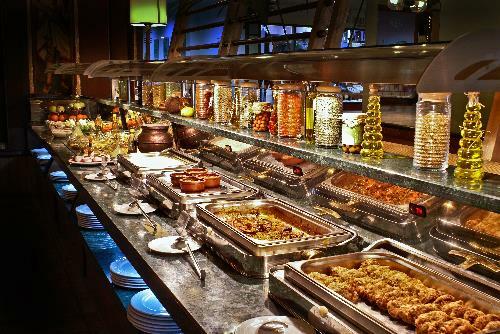 This is the king of all-you-can eat buffets in England. Delicious, freshly cooked food from all over the world. Check one out if you ever get the chance. I walked into the buffet section and it was glorious. It was like the scene out of Charlie and the Chocolate Factory where the kids see the chocolate room for the first time. Deliciousness as far as the eye could see. 10 plates later, I was ruined. For four days, I uncomfortably waddled around in varying degrees of pain. My eyes had been bigger than my belly. The amount of food I had in 90 minutes there could have probably fed me for three days. All at once, it created major problems. I actually gradually retired from buffets after this episode. It's the same with changing your athleticism. If you want to become more free and mobile to improve your speed and strength, it's best done a tiny bit at a time. Feeding your athleticism this way allows you to digest the changes properly. Gorging on mammoth sessions just leaves you uncomfortable and does no good for you digesting and absorbing any value. Small and often, not all at once. That's the way your nervous system can best make the changes you want. Your tissues and joints take time to adapt. I'm also going in the same direction with the blog. I'm making the content more palatable for you so you can really benefit from it. Keep an eye on the exciting changes over the coming days.